The prior existance of Ginalsburg and Teutonia with their several hundred inhabitants makes it seem quite likely that there was some burial place in the Clermont area, other than the present cemetery, that has been long forgotten. There must have been a need for such a facility prior to 1848. Of Course burials at that time too, were quite often made by the pioneers simply in some quiet spot on the landwhich they were tlling. In 1928 when the macadam road was constructed between Clermont and Marvindale, two such burials were unearthed when a cut was being made in the hillside adjacent to the Clermont schoolhouse. However, there had been burials in the plot for at least the preceeding 25 years. As mentioned before, the earliest burial for which there is a certain record was that of Joel Bishop's wife Amanda who died in 1848. Between that date and 1873 when the original land purchase was made, there were about 17 burials. J.W. Anderson was the writers paternal grandfather. John O. Sonburgh was the Justice of the Peace who notarized the deed. Sometime late in the 1890's the new plot immediately east of the original cemetery was acquired from the Boyer estate. For some reason now obscure, the Trustees never paid the Boyers for this plot and when George Silfies bought the farm from the Boyers, he was told that a parcel had been sold to the cemetery but no payment had been made and no deed had been delivered. This is still true as of this writing - deeds exist for the two parcels that make up the old cemetery, but there is no deed for the parcel making up what we now think of as the new cemetery. 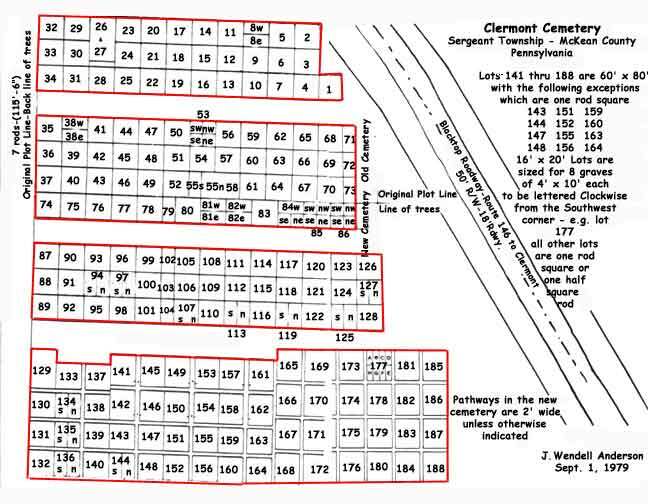 Uner the rules of adverse possession the parcel is now legally the property of the Clermont Cemetery Association even though there has never been a formal conveyance of title. The law provides that where an occupier holds land and maintains actual continuous distinct and visible possession for a certain stipulated time - which in Pennsylvania is 21 years - he is deemed to have the legal title. There appears to have been no burials in the new cemetery until about the turn of the century. The earliest seems to be that of Edna Whitaker who died April 10, 1899 and is buried in Lot #120.